Thailand’s justice ministry froze some of former Prime Minister Yingluck Shinawatra’s bank accounts, the ministry and her legal team said on Monday, in relation to a $1 billion fine imposed by the ruling junta over her administration’s rice-subsidy program. Thai police have seized nearly $21 million worth of assets, from cars to cryptocurrency, belonging to the late founder of dark web marketplace AlphaBay, who died in a Bangkok jail this month, they said on Monday. 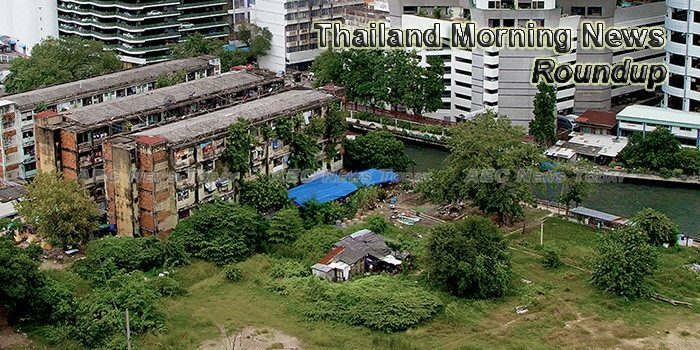 Fraud in paddy storage for the rice-pledging scheme in the lower North has caused more than 90 billion baht in damages, says the Public Sector Anti-Corruption Commission (PACC). The Prime Minister praised a startup company for winning the first prize of a global business model. The commercial sector is likely to adopt Internet of Things (IoT) technology at a much faster clip after the 920-925 megahertz spectrum was approved for use in IoT devices, the National Broadcasting Commission (NBTC) said yesterday. Chinese Foreign Minister Wang Yi reaffirmed on Monday that the train project linking China with Southeast Asian countries, including Thailand, the eastern seaboard and Laem Chabang deep-sea port will greatly benefit Thailand upgrade the status of kingdom as the communication hub of Asean. An executive decree to regulate the employment of migrant workers and potential delays in the government’s big-ticket infrastructure investment could drag on Thailand’s economic growth momentum in the second half, economists caution. A TOTAL of 101 temporary centres began a 15-day project to register foreign migrant workers across Thailand yesterday. Various agencies under the Ministry of Labor have established a center in Trat province to facilitate the registration of undocumented foreign workers. The Finance Ministry will seek cabinet approval in the next week or two for a 40-billion-baht budget to assist people who qualify for the government’s welfare and subsidy scheme, says finance permanent secretary Somchai Sujjapongse. The Ministry of Public Health has instructed its provincial offices and hospitals nationwide to prepare for possible flooding, as a tropical storm moves across the country. Environmentalists have called on authorities to rethink amending Thailand’s environmental protection law, reasoning that the amendment process lacks public oversight. A THAI investor plans to build a train repair and refurbishment centre in the Eastern Economic Corridor (EEC) to take advantage of the government’s decision to extend the railway system. The Governor of Trang province has delivered a speech to state agencies and local businesses to clarify the government’s royal decree on foreign labor management and how the province facilitate the transition. Supporters of Yingluck Shinawatra have again been warned against participating in public gatherings when the Supreme Court hands down a ruling on her controversial rice-pledging scheme next month, or face legal action. The Appeals Court today reversed the sentences handed down earlier by the Criminal Court on six yellow shirt leaders from two years to eight months after finding the first court’s jail sentence too hefty. Labor Minister Gen. Sirichai Ditthakul disclosed that the Ministry of Labor (MOL) is concerned about SME businesses, as some migrant workers had returned to their countries and may not return for work in Thailand, which could cause labor shortages and disrupt SME businesses’ operations. TPI Polene Power Plc (TPIPP), the SET-listed power arm of Thailand’s third-largest cement maker, will invest in several waste-to-power projects nationwide, pending a revision of regulations. CHINA has officially invited His Majesty the King Maha Vajiralongkorn for a state visit, Chinese Foreign Minister Wang Yi said yesterday during his official visit to Thailand. Provinces within the Northeast 1 region have banded together for an exhibition showcasing their investment potential. A reform panel headed by Thai junta chief Prime Minister Prayuth Chan-ocha on Monday approved a “reconciliation social contract”, part of a plan aimed at healing years of political division, but critics of the military were not impressed. The national reform committee on justice has pledged to complete its plan to overhaul the annual police review process before the end of the year. A group of southern insurgents launched an attack on the operation base of an infantry company of Pattai Task Force 24 in Nong Chik district late on Sunday night after stealing a vehicle and killing its owner, police reported. Japan’s FamilyMart UNY Holdings (8028.T), Japan’s second largest convenience store chain, is considering partnering on new business with China’s CITIC Ltd (0267.HK) and Thailand’s Charoen Pokphand Group, its president told Reuters. The government is speedily verifying the qualifications of low-income earners who have previously applied for the state welfare program. Prime Minister Gen Prayut Chan-o-cha says the government is adamant that Thai citizens have equal access to higher education. Migrant workers can apply for a work permit at registration centers to be open from today to August 7th, according to the Labor Ministry. In today’s special feature, we will explore the joint emergency drills in preparation for all forms of disaster ordered by the Prime Minister General Prayut Chan-o-cha. as part of the country’s national security policy.